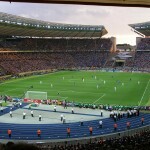 International soccer tournaments attract enormous attention in most countries. Germany is one country in which these soccer tournaments are especially salient: media coverage is very high during the tournaments and the whole nation seems to be obsessed with the performance of the “Nationalmannschaft” — the German national team. Given all the attention and excitement, people have been speculating whether events like the FIFA World Cup or the UEFA Euro Cup also have economic consequences — to be sure, in standard economic theory they shouldn’t. A new discussion paper by Philipp Doerrenberg and Sebastian Siegloch, forthcoming in Economics Letters, analyzes whether the excitement of the soccer-fanatic German population affects the labor market, in particular the behavior of unemployed people. Looking at all World and Euro Cups from 1984 to 2010, they find that tournaments have a substantial and important economic impact: unemployed individuals are more motivated to work after a tournament. They plan to pick up a job earlier, they would rather work full-time than part-time, and they seem to be more confident, which is reflected by their perception that it will be easier to find a job and by their higher wage demands in future job negotiations. In addition, the authors find that people feel healthier after a soccer tournament.